Best Sit Stand Workstation – Give Your Back A Break! 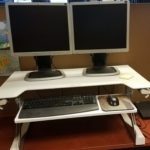 You are here: Home / Buyer's Guides / Best Sit Stand Workstation – Give Your Back A Break! If you want to find out what is the best sit-stand workstation, please keep reading. I will outline the different types and options available, and tell you what I like, or don’t like about different models. With so many options available, I will offer some sit-stand workstation reviews and hopefully take some of the legwork away for you. One of the items my chiropractor recommended for me when I was recovering from my back injury is a sit-stand desk. Using a sit-stand desk has really helped me with my daily grind. I find that it is best to vary my posture during the day. If you are like me, you may find that sitting all day makes your hip flexors and hamstrings tight. You really don’t want to sit all day, nor do you want to stand all day. A sit-stand desk offers the best of both worlds, with the option to sit or stand when you need to. Standing up is a great break from sitting, and if nothing else, it gets the blood flowing. There are a variety of ways to stand at work. Standing desks can be custom built and can be very expensive. At a previous job, I made my own custom built standing desk. I found two empty metal garbage cans, turned them upside down and placed each of my monitors on top of the garbage cans. Then I built a stand, out of 12-inch wide pine, for my keyboard and mouse. It was definitely not the best sit-stand workstation, but it worked okay. A little more classy way to go about a sit-stand desk is to actually buy one :). There are a few different styles available, one is the tabletop version. This is a desk that literally sits on top of your existing workspace. This is probably what most people are used to seeing when they think of a sit-stand desk option. There are two levels or platforms for this type of desk. This is now what I have and currently use at work. Both of my monitors fit on the top level and my keyboard and mouse sit on the second platform. There are levers on each side of the desk, and I have the ability to adjust the height of the workstation by pulling up on both of the levers simultaneously, and the desk moves up or down. Whether I am sitting or standing, the keyboard and monitors move with me, so they are sure to be at the right height. I am still able to use the space where the monitors rest, and I can keep a notepad, pen, and other stuff I need and still have room to write things down when I need to. So these types of desks are very functional and serve my needs extremely well. The next type of sit-stand workstation is a pedestal type. This actually clamps on to your desk and typically has a platform for the keyboard. Some units will come with a keyboard tray only or an added worksurface tray. In this regard, it is similar to the desktop version. The monitors are attached to the top of the pedestal to form a “T” shape and don’t sit on top of the platform itself. There is a smaller platform for the keyboard and mouse. Some people find this useful versus the tabletop converter as it doesn’t take up as much room on the desktop itself. It is basically a monitor stand with one or more platforms, for keyboard and mouse, and one work surface, for other stuff you would use at your desk. These can be equipped to handle either a single monitor or dual monitors. This model typically moves vertically (up and down) only. A third type is an adjustable arm style, think robotics. 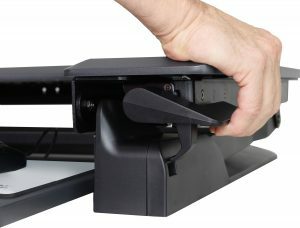 Again, this is basically an elevated monitor stand with platforms, but this one has the ability to twist and pivot (side to side as well as up and down) to the position you need. It may come with one or multiple arms depending on the style. You have the ability to adjust the monitor and platforms independently. This style may also allow you to adjust the angle of the monitors so you will not have to deal with neck and shoulder strain. Within this model, you may be able to move the monitors closer or further away, depending on your preference. All of these options are designed to work with your existing workspace. I find these are these are the most common and can require very little setup. They are designed for your arms to hang at the desired height for your keyboard, and so your shoulder and neck are not straining. The monitors and keyboard move in tandem or independently so you can find the most comfortable fit. You may be able to have one provided by your employer. More and more companies are embracing the idea of a sit-stand workstation. This is a question you will have to ask yourself when you are looking for a workstation for computer equipment. On one hand, the electric setup is nice because you don’t have to lift a finger, okay, maybe just a finger. The heavy lifting is done for you. All you have to do is push a button and the desk raises and lowers for you. If you have back problems, this may be an excellent option for you. Of course, these luxuries in life come at a price. If you need the electric motor and have the money to spend, then more power to you (see what I did there?). If you have an electric model, you will also need to have a power source nearby to plug into. This also comes in handy as many of the electric models also have a USB port built in. If you are able to lift the desk (remember you are also lifting the equipment on top of the desk), you may not want to pay extra for the electric lift feature. My experience has been very positive with having to lift the desk myself. I don’t find it difficult at all to lift, but some people may. The gas loaded models are pretty darn light to lift, as a lot of the lifting is done for you. So, ultimately the choice is yours. You can get into one of these manually operated models fairly inexpensively these days, so that may suit you just fine. How much workspace do you need for the best sit-stand workstation? This is a tough one. I have the Ergotron TL model and there is enough space on the top platform for both of my monitors as well as a notepad, my glasses, phone, etc. There is enough room for more than just my monitors. Some of the desks barely have enough room for dual monitors to sit on top. You definitely want to make sure that you will be able to do your job with the space given. It would be frustrating to be standing up at your desk and have to hunch over, or sit down, just to jot something on a piece of paper because there is no room for your notepad on the sit-stand desk. I prefer a larger deck so that I have ample space for notes and other things on the desk. Some of the desks (probably most) have a keyboard tray which is not only ergonomic for your arms and shoulders but also gets the keyboard off of the main platform. How much space do you have for the workstation? Aside from having enough space for all of your stuff, overall, you need to take into account how large your work area is and see if you have enough space for a large sit-stand desk or a small one. Maybe you only use one monitor, and you don’t need a 40-inch wide work surface, then a 25-inch wide model might work just fine for you. Some of the workstations will raise straight up and down, while others move forward as they are rising. You will want to make sure you have enough space, given the model you are looking at. Is the workstation compatible with a monitor mount? This will give you the ability to mount the monitors above the work surface itself, providing you with more working space. Some models come with a hole cut out in the back, specifically for a monitor mount. The monitor mount is something you typically have to buy separately. What is your budget? These days there are a lot of models available at a variety of price points. You have a lot more lower priced options available today than just a few years ago. These sit-stand workstations have become increasingly affordable. Which sit-stand desk should you buy? I have done a lot of the legwork already and I hope that is super helpful in your search for a sit-stand workstation. I can’t tell you exactly which one will work best for you, but I hope you will find enough information to make an informed decision. These are all highly rated and I think all of them are great products, so I recommend any one of them, I am hoping to help make your decision a little easier. Now feel free to check out the product reviews below. This sit-stand workstation by Lorell is available in a standard size as well as a larger model. The standard size model is available in two colors, black or white. The larger model is available in black. You can see the dimensions of these two different models below. Both models are available with a sixteen-inch rise with five height adjustment stops. You can easily raise and lower each of the units using the adjustable paddles. Gas springs make lifting the desk a snap and the unit is fully assembled right out of the box. The keyboard tray moves with the desk, so it’s always at just the right height. The Lorell desk converter is capable of supporting two monitors with either model. All in all, this is a pretty solid option for the price. Even the deluxe model is well priced compared to similar products in this category. Both models move slightly forward when you raise them, meaning it does not move straight up and down as some models do. The cool thing about this workstation is that it comes with both the desk AND the dual monitor mount included. The monitor mount can hold dual monitors ranging from 13 inches to 27 inches. These features definitely help this unit make the list of the best sit-stand workstation. Although the manufacturer website does say it will fit “most flat panel monitors up to 27 inches”, so you may want to verify before you buy if you plan to mount 27-inch monitors. I can imagine this might be heavy as well as you are raising and lowering. The monitor mount is s full motion stand, so you won’t have to shop for a compatible model. The removable VESA head is great for easy mounting and there is a one-inch adjustment for each monitor so you can get them properly aligned with each other. The monitors can be mounted portrait or landscape orientation and the adjustable tilt will let you find just the angle you need. I really think this is a great option, considering the monitor mounting system. VIVO has designed two different models one electric and one with a manual lift. Let’s discuss both options here and show you the differences. First of all the manual model comes in two color options, white or black. There are eight height adjustment options so you can find just the right spot, up to a max height of sixteen inches. The gas spring lift gives an easy and smooth adjustment by simply squeezing the handles. The desk does offer a hole cut out for a monitor mount, which would be purchased separately. The manual model is capable of housing dual monitors. One really cool feature that goes along with the electric aspect of this desk, is the built-in USB charger. Of course, you can raise and lower with the push of a button. This is a great feature for a lot of people, especially if you have back problems. This workstation offers a large keyboard and mouse workspace, and I think that really makes this model excel. This is a very well priced model that will get the job done for you. It is easy to raise and lower to just the right height. One thing that I find interesting is the front cutout on the top platform (the area right above where the keyboard and mouse sit) is very large compared to other sit-stand workstations. I feel like there is a lot of space that has been lost with this design. However, that will be a personal preference. There are a lot of positive reviews with this sit-stand desk, so it must not be much of a problem for other people. This one is available in a cherry finish, which is a nice color and will hopefully fit well in most settings. I do love the fact that this unit raises and lowers straight up and down without moving forward at all. This is a great option, especially at this price point. Comes fully assembled. Yay, no assembly required. This little guy is great for a home or office setting where a smaller footprint is needed. You can set a single monitor on the top platform, and have a spot for your keyboard and mouse as well. I wanted to include a smaller option for those people who operate with one large monitor, or have a smaller work area. The large freestanding base will support your office equipment without any wobble. The compact size is great and has enough space for a large computer monitor. There is also a slot on the top surface, for your phone or tablet and a cutout for a drink holder. The gas spring lever really makes raising and lower the unit a piece of cake. You will really enjoy the smooth operation this model gives you. This easy to assemble unit will have you up and running in no time. This lightweight unit is a little bit different design than most other standing desk options. The X-Elite Pro offers one large single surface for all of your computer equipment. There is no keyboard tray since everything sits right on top. In the lowest position, this unit sits 2 ½ inches off the desk itself. You have the ability to adjust the standing height anywhere from seven to sixteen inches. You can set dual monitors, or one monitor and a laptop, keyboard, and mouse on the surface. With a max weight limit of 20 pounds, you will need to make sure you do not overload this desk. This is kind of a one-size fits all concept. I like the idea of a single surface, this gives you space for notes, etc., but I also like having the keyboard tray on my sit-stand workstation. Of course, it will depend on your preference. If you have dual monitors, a keyboard, and a few other items, it may get a little crowded. I like desks that rise straight up and down and do not come forward; this one fits that as well. Available in black, this desk will fit nicely in most workspaces. There a lot of positive customer reviews for this unit and I can see why. It is well priced and provides a lot of value for the money. If you need a larger model, they do make an XL which will give you more surface space. FEZIBO makes this larger 36-inch model which has a gas spring lift system. This unit is another highly customer rated unit that will allow for dual monitors as well as a table or smartphone. You can also set this up with a single monitor and laptop and have plenty of space for other items you might need, like a calculator, notepad, etc. This model does move out slightly when you raise it up, so you will have to be conscious of that when you are placing it on your desk. It comes in black only, which should be fine for most people. Again, this model has a lot of positive reviews and is really easy to raise and lower with the help of the gas springs. The keyboard tray is removable if you choose to use it without the keyboard, not sure why you would do that, but it’s an option if you want it. The spring loaded system does lock into eight different height positions, which allows you a lot of options for height adjustments. This is especially nice if multiple people will be using the desk, so you get just the right height. There is also a single monitor, smaller 29” inch unit available that would be great for smaller spaces. If you are looking for a sit-stand desk option, but are a little tight on space, this mini adjustable standing desk is just what you have been looking for. Similar in operation to the above mentioned WorkFit TL, the WorkFit-Z Mini comes fully assembled and ready to help you get to work. You will love the simplicity of this desk converter, it offers the features you need most, it’s easy to adjust and even has a storage space for tablets and smartphones. Moving the workstation up and down is a snap, again, using the hand-brake system, making this a great small sit-stand workstation. You have the ability to adjust infinitely up to 12.5 inches. The smooth and quiet adjustment is just fantastic. With integrated cable management system, you don’t have to worry about messy cables. Typically, you can use this with a single monitor, but if you set it up with a wireless keyboard and mouse, you could have a laptop connected to a separate monitor, on the worksurface platform, allowing you basically a dual monitor setup. This little guy has really big benefits and it’s perfect for a home office or other smaller application. You could even take it with you on the road. This is yet another innovative design from Ergotron. Well, the name says it all this one is electric. No more manually raising and lowering your desk, you can just push the button and it does everything for you. I think this standing desk option is great, especially at this price point. The work surface is large enough to accommodate dual monitors and a laptop if you need to. There is a separate keyboard tray and a built-in cutout that serves as a holder for a phone or tablet. I love desks that raise straight up and down and do not move toward you when you raise them up. I think this provides a lot more stability. The rubber feet will not only help to protect your desk surface from scratches but will also hold the unit firmly in place. The built-in USB port for charging is really handy as well. Come in black, which is a fantastic color for any environment. I think this is an exceptional value for the money. The large work surface is just great. Another plus for this unit, it comes fully assembled! No messing around, you can get right to work. Although you may need some help placing it on the desk, these can be a little heavy and awkward for one person. If you notice in the name is the word “Power”, meaning this desk is a push button, electrically powered desk. That’s right, you don’t have to do any heavy lifting. Well, none of these desks require any really heavy lifting, but with this desk, all you have to do is push a button, and you can adjust the desk to whatever height suits your fancy. There are no predetermined stopping points either, so you can literally raise the desk exactly where you want it. You have the option to set your single, or dual monitors right on top of the upper workspace, or you can purchase the optional monitor stands and mount your monitors. The choice is up to you. There are three (3), two (2) inch holes cut out on the top platform of the desk. These grommet holes can be used for one of two purposes. First, these can be used for cord management, if you choose to have your monitors sit on the desk itself. This allows you to run monitor cables through the holes. The grommet holes can also be used for the optional monitor mounts that I mentioned. The VeraDesk Power Pro comes in a wide variety of sizes and colors. 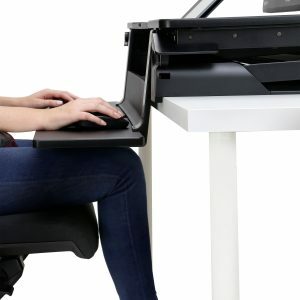 The two-tier design is great, allowing you to have your keyboard and mouse at just the right height, on the keyboard platform, and your monitors placed where you don’t have to strain your neck, all while you are sitting or standing. One other aspect worth noting is that this desk can support up to 80 pounds, all with the push of a button. When you choose the white option, the surface is a dry erase board! A great option for any workspace, the Ergotron WorkFit-TL, Sit-Stand Desk Converter turns your existing desktop into a sit-stand workstation. This is the one I have in my office cubicle and I love it. I think this is the best sit-stand workstation. This workstation has a large keyboard tray and a wide work surface. You can easily fit two monitors on the primary work surface and still have room for other things you need to get your job done. One thing you will really like about this tabletop desk converter is that is moves straight up and down, so the range of motion is the same when it is up or when it is down. You can literally place this unit right up against the wall and it will not bump the wall when you are moving it up or down. The Ergotron WorkFit-TL very stable, thanks to it’s counterbalancing mechanism, no motors or cranks to mess with. Just squeeze the levers (hand brakes) on either side of the unit and move it up or down as you please. The keyboard and mouse tray will move in tandem with your monitors. You will be able to maintain proper posture while sitting or standing. 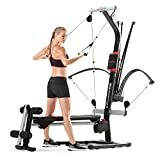 You will not have to worry about putting this together as it ships fully assembled. Just take it out of the box, put it on your desk, or workspace, and go about your day. I do recommend having someone help you, as it’s a little heavy for one person. You can also purchase a separate monitor mounting system which would provide for even more workspace. You can adjust the height of the desk up to 15 inches high and has 20 preset height setting along the way. It locks into place, so you don’t have to worry about the desk collapsing. Again, it’s a very sturdy and stable work surface even when it’s fully extended. I am 6′ 1″ and I have no problem standing with this desk. It’s also easy to move up and down and is very quiet. Well, here is another fantastic sit-stand desk option from Ergotron. This is a newer model and you will now have an even more ergonomic option to choose. You will love the drop-down keyboard tray that the WorkFit-TLE offers. Again, this model ships fully assembled and ready to go. All you have to do is unpack it, put it on your desk and you are good to go. As with the WorkFit TL, monitors can be placed directly on the work surface itself. Ergotron does recommend a monitor mount to help get the monitor (s) at the right height, so you can be ergonomically sound. One other thing is that this particular sit-stand desk is not really recommended for taller users, with the drop-down keyboard. The drop-down keyboard sits about 3.5 inches below the desk level when you are seated. This is something to keep in mind. You may be just as happy with a less expensive model, with fewer bells and whistles. The vertical adjustment is super easy, with the counterbalance mechanism. Ergotron again has made this unit so that it moves straight up and down, so you don’t have to worry about needing extra space when you want to stand up. The hand-brake lever system (there it is again!) is really easy to adjust the height of the WorkFit-TLE. The work surface is sufficient in size, and the entire sit-stand desk is really sturdy. The vertical height adjustment is 15 inches. A couple more features you will really like are the cable management and mobile device trays. You can keep all of your cables neatly tucked away behind your worksurface and monitors to keep them out of view, and in place. The work surface includes an integrated cell phone/tablet station built into the work surface. This allows you to keep your mobile devices close by. If you use your mobile devices in conjunction with your daily routine, you can have them right there in front of you. All in all, this is a great option for a sit-stand convertible desk. Now I will introduce you to the pedestal style sit-stand desk from Ergotron. The nifty features included, help this desk make the list of best sit-stand workstations. The WorkFit-S comes with dual monitor mounts, a tray for your keyboard and mouse, and a separate platform that serves as a work surface. The WorkFit-S is attached to the front of your desk with a very sturdy clamping system that will give you a nice tight fit. A comfortable handle built into the work surface gives you the ability to move the unit in tandem up, or down, depending on your needs. The WorkFit-S glides up or down easily with one hand, on a vertical rail. You can position the unit exactly where you want it. You will really like the fact that the monitors have a five-inch adjustment range, up or down. This is in addition to the unit moving vertically as a whole. So if you want the keyboard and mouse at one height, you still have the ability to raise or lower the monitors. The monitors can be mounted vertically or horizontally, or one of each if you prefer. The WorkFit-S can handle most 24-inch monitor, and some up to 26 inches. The fold-up keyboard platform gives you the flexibility to adjust the keyboard and mouse to an ergonomically friendly angle. The unit comes in black or white. One more quick note on this model, you can move the keyboard up and monitors out of the way when you need more of your workspace on your desk. This model is very versatile and will fit a number of work applications. Overall this is an excellent choice. Okay, remember how I said at the beginning to think about the “Arm” series as a robot, well here goes. Talk about maneuverability! This guy will go where you want it when you want it to. It will move sideways, up, down, back and forth, however, you want it, versatility is the name of the game with the WorkFit-A. If it’s okay, I will say it again, maneuverability is the key to this model. You will find comfort from various angles. Is the sun in your eyes? Well just move, your entire desk to the right, left, up, down, wherever you need to. You will absolutely love the fluid, easy to move action this sit-stand desk provides. This model clamps on to the back of your desk and is ideal for corner workstations. You will see from this video, how incredibly fun work can be with the WorkFit-A model. Here are a couple of other things of note for this unit. The keyboard can be tilted up 90 degrees when not in use, and also has a 3 degree upward tilt for ergonomic benefits. Cords can be neatly tucked away in the elbow of the unit that attaches to the back of the desk. All in all, this is a fantastic option if you are looking for a super versatile, maneuverable sit-stand desk. Another favorite and definitely at the top of the list for the best sit-stand workstation. The most popular and best sellers in the Varidesk line, the Pro Plus 36 is designed for people with dual monitors, or who need a bigger workspace. It comes with an upper deck for monitors, and lower deck, for your keyboard and mouse. Varidesk made their very first desk for a friend who had back pain. They have been rolling ever since. The two tiers give ample space for everything you need to get your job done. There is room for dual monitors up top with space to spare. The desk raises up 14 inches, that is the keyboard height from desk to fully extended, putting the upper deck at 17.5 inches from the top of the desk. The total footprint size of the Pro Plus 36 is 36 inches wide x 29.75 inches deep. This unit does move forward, away from the wall when you raise it. You will really like the dual handle design, and spring-loaded mechanism, which makes it easy to raise and lower. There are 11 height settings to choose from, so you can always find just the right spot. This sit-stand desk is very sturdy with the weighted base, so even when it’s fully extended it is very sound. In addition to black, the Varidesk Pro Plus comes in multiple color options (butcher block, dark wood, and white) and also comes in a few different sizes (30 inches wide and 48 inches wide). Comes fully assembled, so just set it on your existing workspace and you are ready to go. Varidesk has designed a larger sit-stand workstation option that is specifically for a more narrow cube area. The base measures only 22 1/2 inches deep. Again, the upper deck is designed for dual monitors and really offers a lot of space. You will love the keyboard tray on the Cube Plus 40, as it slides out for ease of use and comfort. Varidesk has incorporated the spring loaded easy lift system with this unit as well. With nine different height settings, you will certainly find the right elevation that works for you. The same holds true for this model and the Pro Plus series when you raise the deck, the unit does move away from the wall and doesn’t move straight up and down. Although it remains sturdy when fully extended, with a solid heavy base. You will really enjoy the functionality of the Cube Plus series. This model is also available in a 48-inch model which provides a ton of workspace. No more excuses, you need to get one of these setup! Remember, no assembly required, just set it on your desk and away you go. Well, here is a different look for a sit-stand workstation. This model consists of an aluminum tower that sits on top of your desk, no mounting or clamping required. This is an all in one unit, meaning you have a monitor mount and a keyboard tray that move up and down together. 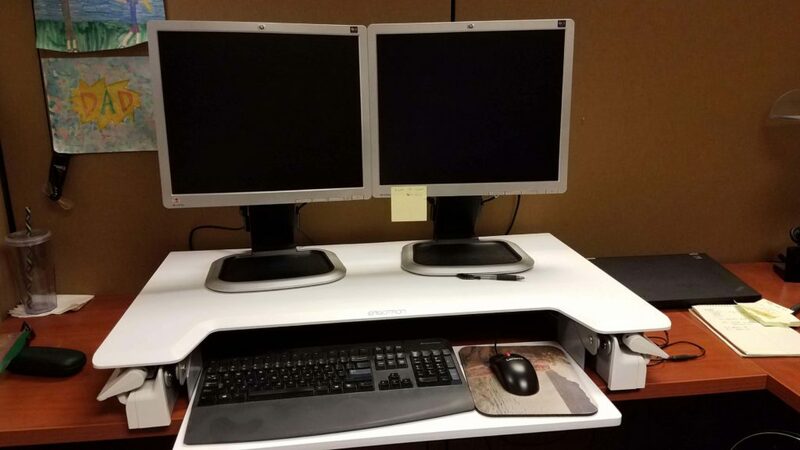 You do not place the monitors on the work surface, which allows you more space for notes, or other items, and the monitors are out of the way. You do not have to hold the button the whole time to lift the unit. One push to start the upward rise and one push to stop it where you want it. A sensor will stop the unit when it reaches the desktop. The sensor will also prevent the desk from lowering if there are any objects in the way, like a coffee cup. The monitors can be mounted in portrait or landscape orientation and come with monitor mounts. The workstation is also available in single monitor version. Overall, this is a unique workstation for the price. A large workspace is attained by mounting the monitors up and out of the way. With so many sit-stand desk options available, I have tried to review some of the models that I think are well designed and will provide you with a better work experience. Personally, I love my sit-stand desk. I certainly feel more productive and it gives me a chance to vary my posture throughout the day. As I mentioned earlier, I have the Ergotron WorkFit TL and I can’t say enough good things about it. All of these are great options, and hopefully, I have provided you with some valuable information in your search for a sit-stand workstation. To decide which model would be the best sit-stand workstation for you, it really depends on your personal choice as to which one you would like. I can attest to the one I use every day, but there are other great models with a lot of positive reviews as well. If you have any more questions or would like to leave a comment, please do so in the comments section below. I would love to know what you think. I will do my best to get back to you as soon as possible. Once again, thank you for reading! What Is A Sit Stand Workstation And How Do I Choose One? I deliver plenty of Veridesks at work and man are they heavy. 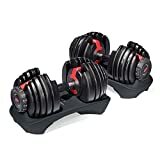 Do to the weight they seem as though they are made of great quality but I have never used one or even seen one out of the box! I know you said you have the Ergotron WorkFit TL, Why did you choose this desk over the others on the list? In your honest opinion do you believe this is the best desk on the list or does one of the others desks stand out from the rest? Thank you for your comment, I appreciate it. Yes, the sit stand workstations are pretty darn heavy, especially if you are lifting them by yourself. You certainly know exactly how heavy. I have personal experience with the Ergotron WorkFit TL. I like the fact that it lifts straight up and down. The workstation is very sturdy and has enough room for me, even with dual monitors on the upper deck. There are definitely other great options, but I really do like the WorkFit TL. I tried to give a variety of options as everyone will have their own needs. Thanks for taking the time to read my post! 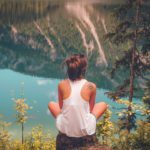 Awesome review, I have heard the new saying, “Sitting is the new smoking”, and that is true! Most of my day is sitting at school; I wish they had these everywhere, especially in offices and schools. 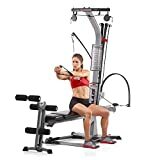 You give a great description of all the products; my personal favorite is the Ergotron Workfit-s desk because I have a dual computer setup right now. I will take time to weigh all these options before I make my final decision, but I will come back and get one, especially for the start of 2018. Thanks! Thank you for stopping by to leave a comment. I sure feel more productive when I have the ability to sit or stand at work. Please let me know if you need any more help choosing a sit stand workstation. Those desks are awesome! I will have to ask my boss if she will invest some money to get one of the desks for little old me. How easy is it to adjust the height of the desks from the sitting to the standing position and vice versa. The second question is: will any of these desks accommodate clip on cup holders. The holder that I have requires that the thickness of the desk be at least 1 inch. Hi Ramona. Thank you so much for your comment, I really appreciate it. First question about raising and lower the desks, it’s really easy. All of these options are designed to make raising and lower a snap, especially the push button model. As for your second question, I had never thought of addding a cupholder and I am really glad you brought that up. I did a quick search and found a cup holder that will fit on the side. You can click here to see it. Great question and I am really glad you asked about that. Thanks again! I agree that alternating sitting and standing is the ideal way to work. I purchased a fancierstudio Riser desk and love it. Great information! I am glad you enjoy your sit stand workstation, that is fantastic. Thank you for stopping by to read my post, I really appreciate it. Wow! That’s a lot of great info you’ve got! 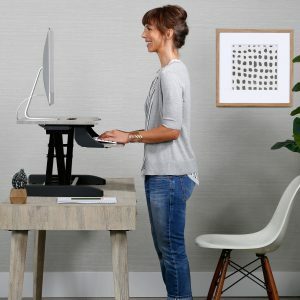 I’ve been looking into buying a full sit stand desk, like the Varidesk one you mentioned, and I like the idea of being able to raise my whole desk up. 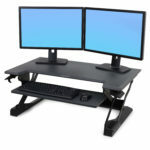 I’m sure they’re a bit more expensive but if you could afford it would you say go for the entire desk or would you stay with a sit stand workstation? Also, I translate documents and have two monitors up at all times. I see some of them support dual monitors but what I’m worried about is the space for the mouse and keyboard. Have you had any trouble not having enough room for your mouse? Thank you again for the info and keep up the good work! I have the WorkFit TL from Ergotron. I have dual monitors on the upper platform and I have plenty of room. My sit stand workstation is 36 inches wide and it is plenty of room for my job. I don’t have a lot of paper that I work with. One thing that is available on the Ergotron workstations is the ability to add an optional monitor mount. This would allow you to get the monitors up off the work surface and give you more room. Varidesk also sells an option monitor mount that fits most of their sit stand units. Again, this would allow you to have the monitors up off the work space and give you more room. Depending on the size of your cube, or office, you could opt for a larger model, even up to 48 inches wide. A co-worker of mine has the full desk that raises up. Her only complaint is that it takes some time to raise and lower. Yes, the full desk version is more expensive. Of course it is up to you. I love my sit stand desk and there are many different options available. Please let me know if I can do anything else for you. Many thanks for this awesome review and like yourself, I too do believe that as we go forward, these type desks will become more and more popular. They are really cool, sleek and also so versatile, they can be used for many purposes, ie, standing or sitting. I suspect that as we go forward, we will see all of the new offices fitted out with this awesome technically designed furniture. Price wise, what would a standard model cost ? Thank you for your comment. I agree, these desks are fantastic, and very versatile. If nothing else, it gets people up out of the seated position. I love having a sit stand workstation. As for cost, ballpark these units tend to run around $400. Some are less and some are more, but well worth it in my eyes. Thanks again, I appreciate your feedback. I am totally sold on this type of work station! It makes you burn more calories throughout the day and it helps so much with low back pain no matter what your weight. I used one in my office for years, only gave it up to travel abroad full time a few months ago. I miss it too! Very useful product. It also increases longevity as you are not sitting nearly as much at work all day long. Thank you for your site. Thank you for your comment, I really appreciate it. I completely agree, I think this is a must for any office job. I certainly feel more productive and refreshed when I have the option to sit or stand. I don’t want to stand all day, or sit all day, so these sit stand workstations are absolutely fantastic. I am glad you liked my post, thank you for reading! Like many people I worked 40+ hours a week for 25 years at a regular desk before the invention of these sit/stand workstations. Result was serious back problems and obesity. Well, better late than never! Since I am a writer now and still at the computer all day (at home) I definitely want to buy one of these. After looking at all this helpful information I’ve decided on the Versadesk Power Pro 36″ because it’s powered and it holds up to 80 pounds when many of the others seem less sturdy. Question: Do you know if the 3 year warranty covers the button if it stops functioning? Yes, I love my sit stand workstation I am so glad I have one. You are right, finally these are making their way into our workforce, and it’s a great thing. Here is the link to the warranty information for Versadesk. According to the website, the electric push button is covered under the 3 year warranty. Thank you so much for stopping by and leaving a comment, I really appreciate it. Thanks for the warranty info. I’m really looking forward to purchasing one of these! I am so glad to see that these sit/stand workstations are now available. This invention was made for me. I spend hours at the computer. In addition, I am a piano keyboard player in a band. I usually perform with 2 keyboards, one above the other, and alternate between sitting and standing during performances. I would now find good use for my work at the computer. Thank you for the reviews. I now have a better idea of the features and look forward to getting mine soon. I am glad to help, and happy that you liked my reviews. I am a firm believer in sit stand workstations. I feel more energized when I get to stand up and work during the day. Of course I don’t want to stand all day, so I have the option to sit. Thank you for leaving a comment, I really appreciate it. Let me know if you need any help with your decision. I do like the Varidesk Pro Plus 36. I do have a question for you on it though. How much weight can this workstation hold? I have a 27 inch Apple and know it’s fairly heavy. I think it’s about 25 pounds. The other monitor is a 27-inch monitor as well. However, it’s about 40 lbs. In total, this workstation will need to be able to support at least 60 lbs. Thank you for your comment and question. To answer your question, the Varidesk Pro Plus 36 can hold up to 45 pounds. If you need to support more weight, I would recommend you look at the Versadesk which will support up to 80 pounds. Please let me know if you need any more help. Thanks again! Can you give me an idea about how many hours of my workday I should stand up? Standing for too long can´t be that healthy, too, can it? You are right, standing all day is not good either, it’s best to vary your posture, by alternating between sitting and standing. Ideally, I would say spend 30 minutes standing and 30 minutes sitting. You may or may not be able to do this in the beginning, but I think that is a good goal to shoot for. Thanks for your comment, and for stopping by, I appreciate it. I love this concept. I wear my Apple Watch to tell my to stand. but, I have a MacBook Pro, not a desktop. Have no need for a desktop. I can’t justify the expense and obviously can’t use a two-tiered system. Do you have any suggestions? Well, you can certainly hook your MacBook Pro up to a second monitor and use a wireless keyboard and mouse if you want to. I see a lot of people using a laptop and monitor on the top platform and they use a wireless keyboard on the keyboard tray. So, you can certainly still use the two tier system. If you don’t want to use a two-tier system, you can go with a single surface option like X-ELITE PRO HEIGHT ADJUSTABLE DESK CONVERTER. This is a great single surface workstation and you can stand up during your work day. As for the expense, that of course is up to you. I can tell you that after using my sit stand workstation, I can’t imagine NOT having one. Yes, it will cost you some money, but in my opinion, it is really worth the expense. The prices on these units have come way down in recent years as new players have entered the market to make them much more affordable. Please let me know if you have any more questions, or need any help. Thanks for stopping by, I appreciate it. Thanks for the suggestion Steve. I ordered today. It looks like just what I was looking for. I am just not a extra monitor person. I receive it on Friday, will let you know. You are welcome, I hope you enjoy your new sit stand workstation. I love the option of sitting or standing. However, I much prefer a treadmill desk. When I stand too long, my feet tend to ache a bit. Doing a slow walk constantly prevents that from happening. Oh, good call, I would love to try a treadmill desk, I have not had the opportunity. 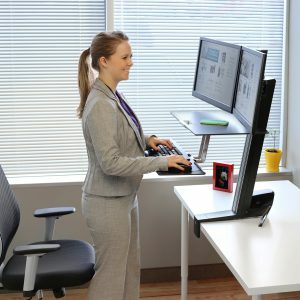 I do agree that standing too long is also not good, so that is the beauty of the sit-stand workstation option. Thanks for stopping by to leave a comment, I appreciate it. Great review of these sit-stand desks Steve. I would like to get one of these for my home. I particularly like the pedestal type desks with the two screen fixtures. I am looking to upgrade my computer and get two monitors so this looks like a great choice for me. I’ve never worked at a computer while standing up but I see the benefits of doing so. Does it take long though to get use to it? Also, do you spend as much time standing as sitting? Thanks for your comment Owain. I agree with you on having the monitors up and out of the way. I have he WorkFit TL model and there is an option for monitor mounts, but I have my monitors sitting on the work surface. This set up works well for me. As far as standing up vs sitting down, I try to do about 30 minutes each. It can take some time to get used to standing, you this may be something you have to work up to. Please let me know if you have any more questions. Thanks again for stopping by, I appreciate it. I love this idea and to be honest I have not come across it before. A sit stand work station is so ideal as there is nothing worse than that lower back ache or shoulder ache form prolonged sitting and typing. The Ergotron TL model looks really appealing and I have actually booked marked this page. I am currently designing a home office and this would fit in very well!! Hi Darren, thanks for stopping by. Please let me know if you need any help, but I think you are on the right track. I agree, the Ergotron TL is a great option, and this is the one I use myself. I appreciate your comment!